As Boston’s curly hair experts and Newbury Street’s only Ouidad certified salon, we are pleased to offer a new hair treatment. 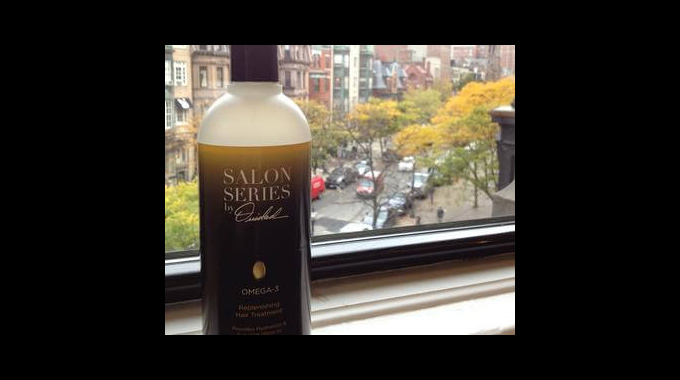 Omega-3 hair treatment by Ouidad is a hydrating, nutrient replenishing mask for curly hair in need of moisture. When used on wet hair and processed with heat, the combination of omega fatty acids strengthens the protective surface layer of hair and restores the natural lipid barrier. The key ingredients, including flax seed oil, passion fruit seed oil and acai pulp oil act as a protective barrier around the hair sheath while simultaneously hydrating dry, damaged hair. Formulated without silicones, sulfates, parabens or waxes, the Macroloba oil provides the perfect amount of shine and softness without leaving a greasy residue. The treatment is applied to wet hair from roots to ends, concentrating on the scalp. It should then be processed with heat for 5-7 minutes–applying heat will open the cuticle to ensure maximum moisture penetration for the hair. It should then be shampooed out of the hair and curls are left soft, supple, and completely hydrated. The treatment is complementary (normally $50!) for the month of November, when booking a Ouidad haircut with J. Despres or Catherine Sorrentino. Call 617-536-9600 for an appointment.